Mozilla recently unveiled a fresh Firefox interface designed to better organize open tabs, and as this "Tab Sets" prototype — née Tab Candy — works its way into the Firefox 4 beta, Opera would like you to know that it's been offering something similar for ages. "There has been a lot of focus on grouping of tabs in browsers lately as a new and wonderful way to manage tabs, but did you know that you have actually been able to group tabs in Opera for many years already?" asks Opera man Haavard Moen in his Blog from Behind the Trenches. Whereas Firefox Tab Sets lets you sort tabs into groups as if they were playing cards on a table, Opera has long used a "tree" approach to organize open browser windows and the tabs within them. "It might not be obvious that it can be used for this purpose, but the 'Windows' panel in Opera shows all your open windows, and the tabs within each window," Moen writes. "Now, just think: 'Window = group.'" This, however, is disabled by default. To turn it on, hit the "+" on the "panel selector" running down the side of the browser and select "Windows." As Moen points out, you can collapse and expand groups, and a group is named after the tab within the group that's currently arrive. You can also move tabs between groups via drag and drop, and you can rearrange tabs within each window. You can drag a tab outside of the existing group to create a new one. Plus, there's a search field for quickly locating tabs. 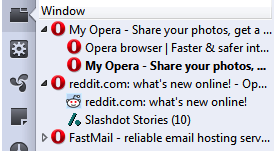 Opera can also save your open windows when you close the browser. To do so, Moen points out, you should use "exit" from the menu, rather than pressing Alt+F4 or clicking the 'X' icon that closes the window.